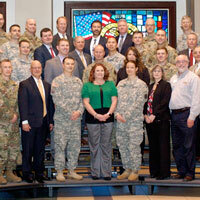 Ervin (center, in green) was one of 16 graduates from a range of fields at the National Security Roundtable. Katie Ervin, Midwest Region director and director of the Fort Leavenworth campus location, was one of 16 participants in the National Security Roundtable program co-hosted by the U.S. Army Command and General Staff College’s School of Advanced Military Studies (SAMS) and the CGSC Foundation March 8-9 at the Lewis and Clark Center on Fort Leavenworth, Kansas. Participants in the program came from diverse industries and professions, including banking and financial services, legal, business consulting, construction, defense contracting, government and academia. Representatives ranged from national banks to Lockheed Martin to Webster University. One of the highlights was a panel discussion with SAMS faculty members, “The South China Sea: A 21st Century Trade and Security Issue.” Read more about the event at the CGSC Foundation page. Paula Hanssen, associate professor and head of the German Section in Webster’s Department of International Languages and Cultures, was honored by the German American Heritage Society of Saint Louis on Saturday, March 12, with the organization’s Friedrich Hecker Freedom Award at their 26th annual black-tie dinner at the historic Racquet Club - St. Louis. The award, named for a popular 1848 German revolutionary, emigré to the St. Louis area and abolitionist, is presented each year to an outstanding individual who has worked to promote cooperation and understanding between Germany and the United States. Hanssen has been teaching German since 1985, and has been at Webster since 1993, teaching German and helping students travel to German-speaking countries. She has served as chair of the ILC department and is now chair of the International Studies Committee, and also serves as Secretary/Treasurer of the International Brecht Society and in the Education Committee of the St. Louis Stuttgart Sister Cities organization. She helps coordinate the German offerings at the Webster Vienna campus, and helps with support for students studying in Trier, Germany, as well as in Vienna. Reed accepts the Patriot Award. 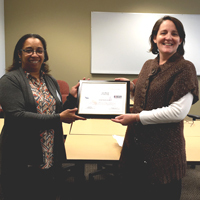 Margaret Reed, director of Webster Colorado Springs, received the Employer Support of the Guard and Reserve (ESGR) award, the Patriot Award, for her support of the Reserves and Guard members. The award recognizes Webster's pledge of support for Guard and Reserve members, who train and serve voluntarily while also bringing their skills and leadership to the workforce.